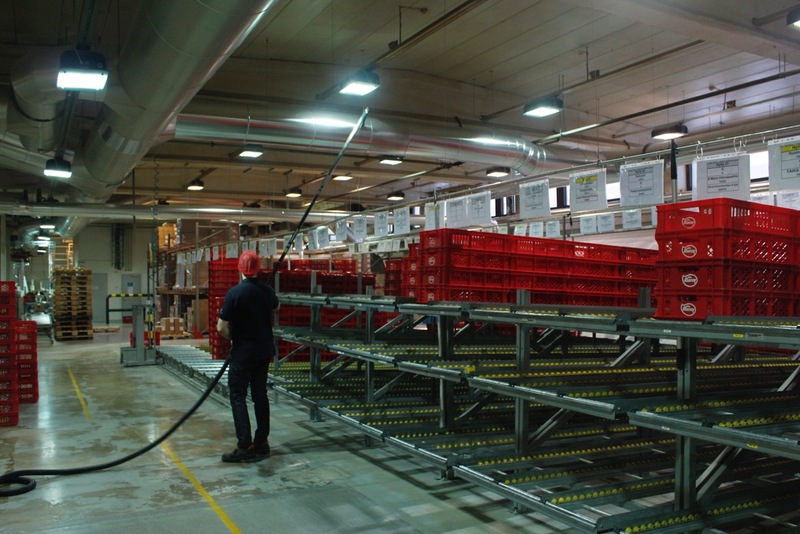 The Food & Drink sector – particularly those areas involved in the storage and production of food have long presented a unique set of challenges for cleaners and facilities managers. Clearly the production of food and drink is one that requires the highest levels of hygiene and cleanliness with no chance of cross contamination or non-organic matters finding their way into the food chain. These contaminants can include things like dust or even (as in the case of this bakery in Finland) build ups of pests such as moths. In addition, the environments within these facilities often present their own sets of issues. Firstly there is the size and structure of these sorts of facilities. 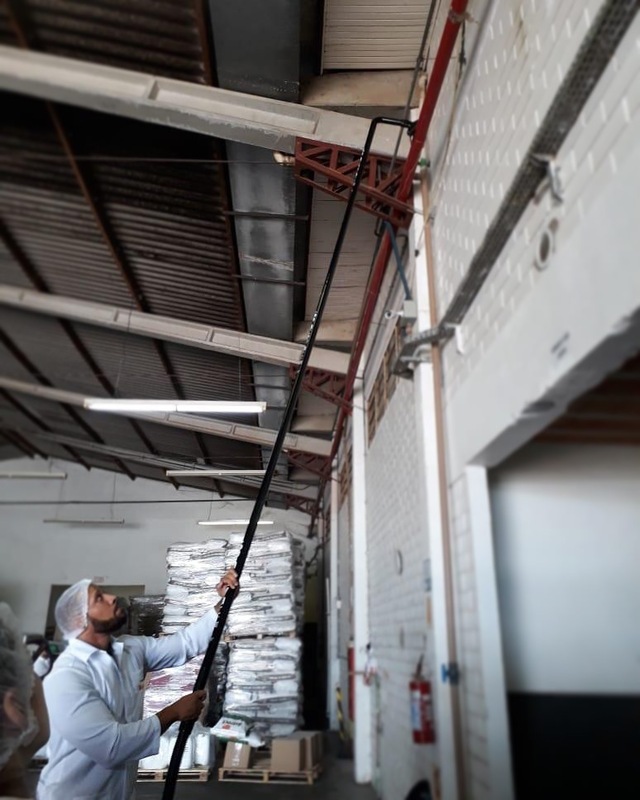 Even smaller facilities like bakeries are often huge production facilities with high ceilings. Underneath these high-ceilings will often be a myriad of pipework, ducting and other built in obstacles above eye level. All of this in addition to the large and often immovable conveyor systems that move around the floor of the facility. Finally – another challenge facing the Food & Drink sector is the build up and deflagration of organic matter and by-products from things like grain, rice, flour and sugar. Area’s where these risks are present are designated as ATEX explosive atmospheres (labelled differently elsewhere in the world – Div.2 for instance in the USA) and need to be treated with caution. The organic matter in the air in these confined areas, present a significant risk of ignition so any cleaning equipment used to remove the dust and other materials needs to be be not only completely conductive but also need to ensure that there is no chance of a spark or static being discharged. With all of this to consider – its clear that keeping the bakeries and breweries of the world clean is no mean feat! Luckily SpaceVac deals with all of the issues outlined above with aplomb. 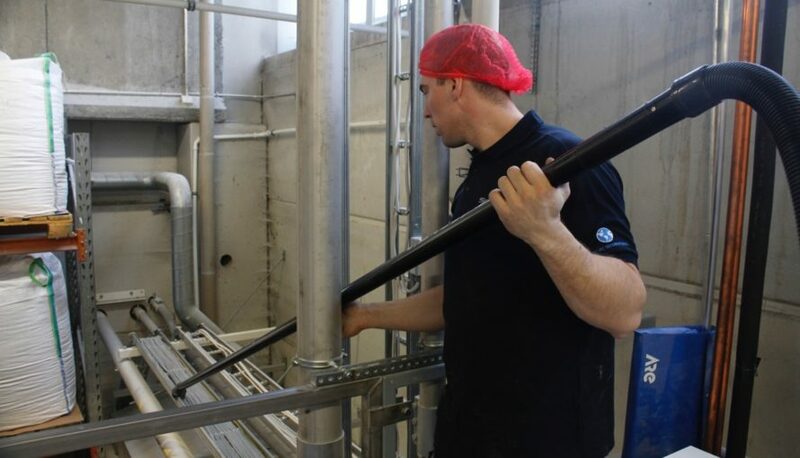 To begin with, our cleaning system is a simple one man operation; where previously operators would have to work in teams utilising access equipment such as scaffolding, ladders or scissor lifts to reach inaccessible areas; our high-reach cleaning poles enable operators to clean up, over and around any high-level obstacle with ease. Further our range of angled heads and tools make reaching into even the most inaccessible of areas a breeze as well as providing a wide range of tools and brushes that provide options for pipework, ducting, walls, floors and many other environments. While not only faster and more cost effective than traditional methods – SpaceVac was designed with safety in mind. In addition to the Safety Locking mechanism that features across the system to ensure no part of the system separates and falls on operators during use, but our ATEX cleaning system was the first system of its kind anywhere in the world, to be certified as safe for use with ATEX designated explosive atmospheres. This fully conductive version of our high-level cleaning system has helped some of the worlds biggest companies get to grips with the risks presented by combustible dust. To find out more about our ATEX cleaning system – why not a book a demo for yourself using the short form located here.